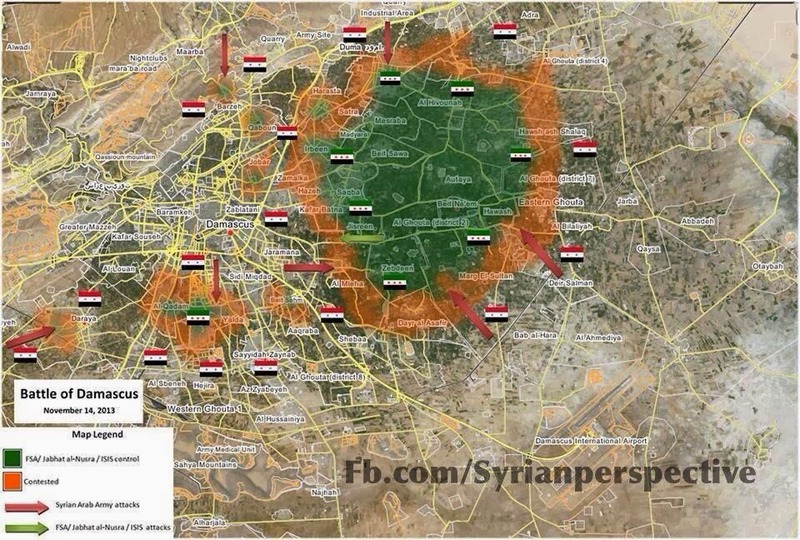 This is the updated map of Damascus after the victory in Hujjira. The terrorists of Ahrar al-Sham still control the Ghouta with their buddies in Liwaa al-Islam. The following areas are on the verge of being fully liberated: Barzeh, Darayya, Qaboon, and Zamalka. In Aleppo, the eastern front has officially been cutoff to the terrorists at Al-Baab (“the door”). This forces the terrorists to rely on supplies from the north at Sheikh Najaar, in the Industrial Area. The supply route to al-Baab was critical for the terrorists; this loss will pay dividends in the long run as the Syrian Air Force will obstruct any attempt from the baboons of ISIS to infiltrate from Al-Raqqa. If the SAA can close the northern corridor in Sheikh Najaar, the SAA will have successfully cutoff the terrorists from all integral supply routes; thus, trapping what is left of them. In Latakia, the SAA forestalled the new Jabhat al-Nusra offensive dubbed, “The Lions of the Mountain,” which is their attempt to infiltrate the Prophet Isaiah Mountains and to breakthrough the lines near the Turkish border. However, this offensive was over before it began. 112 terrorists have been killed in two days at the border of Latakia and Turkey. Also in Latakia, the Syrian Arab Army killed 71 terrorists at Salma as the SAA has advanced its position deep into enemy territory. Salma is the last stronghold for members of ISIS and Jabhat al-Nusra on the Latakia front. Mongrel rats blowing up empty Syrian army fortifications once build having zionist enemy in mind. Today Saudi rats are making sure izrohell orders are fulfilled without any second thought. Enemy within your own population is the worst. Wahhabi baboons. I think the Lebanese are sick and tired of the drug rackets going on in Lebanon courtesy of the Iranians and the Syrians. Oh believe me, for the most part, they don’t use the stuff but they don’t think there is a problem selling it to others. They exchange the heroin and opium and hash etc for guns and hard currency and it has been this way for years , ever since the first Assad took over. Watch out for a huge counter attack in Aleppo by ISIS and Jabhat al-Nusra before this year ends! I bet they know how to defend their land and stomp out cockroaches too…. ship full of guns and ammo headed for Tartus, stopped in Greece territorial waters. Guns for drugs courtesy of Assad and his drug trafficking goon squads. i suppose the one good thing about having so many of these accursed small towns to clear. is that the rebels will have to go through the same laborious measures to win them back. i think the syrian military should start using the full power of their airforce and missile capacity. they have been way too hesitant. How many of the Terrorists are holed up in that Ghouta area?. It looks pretty large area on the map….I’m guessing about 30-40% of Damascus! Am i correct in saying the total of FSA, ISIS, Al Nustra + others…..are around 100,000 in the entirety, whilst the SAA plus allies are about 250,000? Keep crushing the RATS !! they denied this but this article now has them admitting it, and the glue shut the eyes so no one knows what they have done. It’s a crying shame what is happening to Syria. I hope soon the violence will stop and peaceful normality will ensue. But it seems the only way that will happen is when every murderous Wahhabi terrorist rat is killed or captured. How western governments can justify supporting such animals is a mystery to me as most of the western populace hate such creatures and show clear support for Syria in its struggle against them. A wish for peace for Syria from the UK. Don’t waver, my pathetic little 21st century Petain. Meanwhile, here is a young boy for your pleasure…don’t mind the other guy with the camera, he’s just there to protect our “investment”. Fantastic coverage (imo) from ANNA news about Barzeh. Better working access to Syrian SANA News (at least for now). Israel is laughing out loud as well as KSA and Turkey. No amount of SAA-IRGC-Hezbollah-Kurdish forces can destroy or penetrate the heavily fortified ISIS and Jabhat al-Nusra in Aleppo. Assad may have won just a few battles but not the war. One of the best E. Coyote moments, baboon operates rocket launcher. dead hizbollah commander, all dressed up to go on a journey. where is he going ? israelis grant oil lease concessions to Rothschild company , in the Golan Heights, disputed territorial area. Nice of bibi to do such a thing. Iranian resistance movement demands investigation of massacre at Ashraf. The United States is no longer using Syria to fight a proxy war against Iran. That’s over. Turkey’s Erdogan regime, the Saudi’s, and the other camp followers of the throw Assad out campaign are stuck holding the bag, left to their own devices. To borrow a phrase, the United States has no permanent friends or enemies, just permanent interests. In this case, it is the rapprochement with Iran. Russian soldiers fighting for the regime. As for Russians, not to sure what to think. Or just maybe i hope the one Syria has has been upgraded. an act of God against the KSA? Iranian dissidents will divulge secret sites next week, that are located in Iran that Iranian government has not disclosed to nuclear inspectors.